Since your reception area is the first part of your office that visitors see, having a stunning indoor fountain here can be one of the best decor moves. Choose a fountain that will match not only the colors, materials and style of your entire office, but also the company's image. For instance, a rustic stone fountain in a cutting edge, high tech company would seem out of place, and stainless steel would definitely be a much better choice. 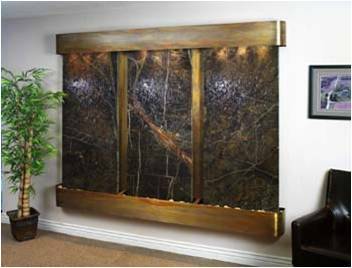 If your reception area is small and doesn't have room for a large indoor fountain, consider a wall-mounted version. It can be a great office decor solution if you're stuck as to what kind of artwork you want to hang on the wall. A beautiful wall fountain does double duty as artwork and a producer of soothing sound. Your receptionist will probably appreciate the effect of a fountain dulling the voices of waiting visitors talking amongst themselves while she's on the phone with clients. Let's face it, tempers can get downright overheated in some boardroom meetings. What better way to calm everyone down than with an indoor water feature? If you own your building and are considering doing renovations, adding whole walls of water, perhaps with soothing colored lights or other details, could be stunning. If you'd rather think a little smaller, at least for the present time, a custom table-top water fountain can be the perfect idea, especially if you're renting office space and can't install a whole water wall or bubble wall. The soothing water sounds and visual appeal of the fountain may even help people think before they speak! Hardworking employees deserve a restful place to regroup and relax during coffee and lunch breaks. Happy workers are going to be more productive and refreshed too. Think about adding a wall, table or corner indoor fountain in the break room to create a peaceful resting area. Just a few seating pieces around the fountain, and perhaps a simple coffee table, can be the perfect office decor solution additions. This area should be set away from the noisier, kitchenette part of the break room for the most relaxing effect possible. 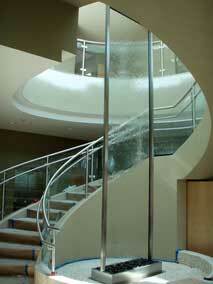 A water feature located in an executive office can bring a feeling of prestige and luxury. Of course, busy executives also usually need all of the stress-relieving methods they can handle and a desk-top, custom water fountain could be one of the most ideal office decor solutions for any company. If you're having a table-top fountain custom made for a desk, consider the size so that it won't take up too much workspace. A taller, rather than wider, fountain design could be the best solution. In some offices, a wall fountain could be a better idea, and again, it can do double duty as movable artwork.